Please note that “early bird” reduced fees are only available until the end of Sunday 5 May 2019. The theme of SCUTREA this year is “Adult Education 100: Reflections & Reconstructions”. Stephen Brookfield will give a keynote on ‘Recommending Contention: Reflections from Trumpland on the 1919 Report's call for “discussion of controversial questions”’, and there will be nearly fifty papers and workshops. We look forward to welcoming you to Nottingham in July. If you are unable to attend, or watch the live stream, the event will be recorded and uploaded to our website as soon as possible. 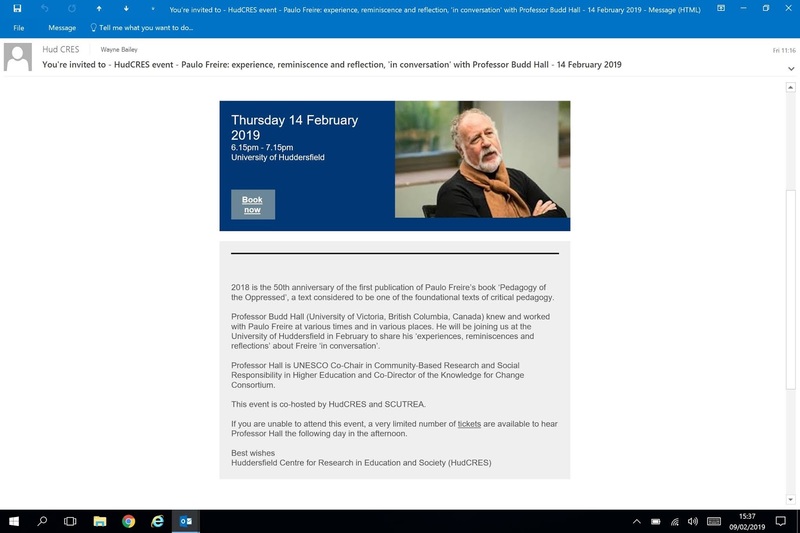 This conference is an opportunity for adult educators and scholars to join a global reflection on what the field has achieved across the world over the past century, on where we are now, and on how adult education should be "reconstructed" for the century ahead. We invite proposals for papers and symposia that focus on theory, research, practice and policy in adult education and lifelong learning. We particularly encourage proposals that do so within the approaches and traditions advocated by the 1919 Adult Education Report, or engage critically with its legacies. Extended deadline for submission of abstracts: Monday 18th February 2019. The Call for Abstracts can be found at the following link. power of a University education is first harnessed in many different settings. SCUTREA was established in 1971 as a network of adult educators involved in researching and teaching adults. Initially members were drawn from university adult education departments throughout the United Kingdom. Today, with the broad spread of lifelong learning activities and international interest in adult education the membership is diverse which makes our annual international conferences very interesting and lively events. We have regular and close contact with colleagues from Australia, Canada and the US, and individual members provide strong links with the European Studies for Research in Adult Education. SCUTREA holds a three day conference each year, usually in early July, the proceedings of which are refereed and published. Students and participants interested in research but not research active are also welcome. For details of past and current conferences click the Conferences tab. If you are interested in organising seminars and other events with SCUTREA please let our Chair know. We make a number of awards for the best student paper, and papers focusing on social justice, international or comparative issues. We also have an award for small scale research. For further details click the Awards tab. We have three types of membership, institutional, individual and 'Friends of SCUTREA' for those who have retired. Benefits include preferential NIACE Journal Subscription rates for Adults Learning and Studies in Education of Adults, book discounts and SCUTREA conference discount. For further details click the Membership tab or contact Olivia Harrison, our Membership Secretary. Membership Secretary: Olivia Harrison, University of Sheffield Communication Officer: Wayne Bailey, University of Huddersfield Click the Contacts tab for contact officer details, and click the contact us tab to send us news and information that you would like added to our web site or Twitter feed @SCUTREA14. For copies of the SCUTREA constitution, past editions of SCOOP, links to adult education sites and resources click the Library and Links tabs above.